PRETEND PLAY “LOT`S OF FOOD” KITCHEN FUN AWESOME VARIETY! GameTime recently completed a custom playground in Arlington, Texas at River Legacy Park and its unlike any other playground in the country. The city of Arlington wanted a unique play space that was fun and exciting. They also wanted it to look like an extension of its natural environment. 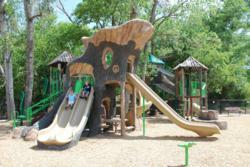 Arlington turned to John Fain, ASLA, LEED AP of the DFL Group, LLC to renovate the park and to design a new playground. He collaborated with Gary Kutilek, R.L.A. of The Landscape Alliance and together they imagined a playscape that was far more exciting than any they had seen. Their vision was to extend play beyond the confines of a traditional playground structure, allowing children to explore the natural surroundings in a unique way. GameTime’s custom play division, PlayWorx, designed custom play sculptures that complemented the natural landscape. A giant tree stands at the front of the playground with themed slides and ladders. Custom rock and vine climbers are designed to mimic the look and feel of a natural forest setting. The centerpiece of the playscape, however, is a series of custom, elevated nets that allow children to leave the play structure and explore the wooded areas beyond the playground. We had never seen elevated net tunnel systems, but we wanted to weave nets through the trees to further utilize the natural elements of the park, said Fain. When we approached GameTime with the idea, they were excited to be a part of the project and they took care of all the engineering to make our concept a reality. From the outset of the project, GameTime Senior Vice President Tom Norquist knew this was an opportunity to take play where it had never been before. We took the vision of John (Fain) and Gary (Kutilek) and created this amazing net system that takes children up into the tree canopy. Theres nothing else like it. This is the kind of playground that is usually only seen in a childs imagination…when children see something this bold and different, it inspires them to imagine even greater things. River Legacy Park is an exciting example of how any vision can be made a reality when the right team is in place. Gary Kutilek believes the MVPs of the team are the City of Arlington and Parks Project Manager Kurt Beilharz. Kutilek said, They really deserve a lot of credit for the project. No matter what we design or what a manufacturing company produces, it doesnt come to life without a client that has the courage, interest and enthusiasm to try something different and exciting. About GameTime: GameTime has been a pioneer in commercial playground equipment since 1929 with a commitment to enriching childhood through play. GameTime combines the vast wealth of research and intellectual resources of our parent company PlayCore with an unmatched distribution network to lead the industry with innovative products, programs and play environments that inspire a child’s imagination and promote health and wellness for future generations.